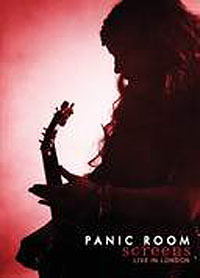 Share the post "DVD review: PANIC ROOM – Screens Live In London"
Crowd funded by ‘Roomies’, Screens captures Panic Room in ‘full flight’ at Islington Assembly Hall in October 2016, and is available in Standard and Deluxe Editions, the latter’s main additional features being three ‘bonus’ songs, plus sound check and rehearsal footage. The 22 track set – which embraces the band’s five studio albums, is also available on CD, again in two formats – in a standard double jewel case, or as a limited edition digipack with 32 page photo booklet. In using Toward Infinity, who have been responsible for all Marillion’s live DVD releases since 2007, Screens captures an ‘up close and personal’ view of the show, and the essence of the band’s live performances. That said, Panic Room aren’t an overly visual band. And fairly rudimentary lighting (which makes much of the footage a little ‘dark’) aside, they’re almost exclusively reliant on Anne-Marie Helder as a visual/stage focal point. So Tim Sidwell’s team have had to use plenty of camera angles, close ups, cropping, and splicing to keep things moving along from a visual perspective. It’s also worth adding that the sound has been captured to perfection by Tim Hamill – the engineer responsible for recording and mixing each of the band’s studio albums since 2010. Live sound recordings don’t get much better. So what you get is very much a Panic Room gig in your living room – a typically virtuoso performance from bassist Yatim Halimi, some blistering runs from Dave Foster (but come on Dave, smile a bit more for the camera! ), Jon Edwards keeping to the shadows but at the core of the band’s sound, and Anne-Marie doing what she does best – looking alluring, and sounding even better. It’s an all-round consummate performance. What the DVD does reveal, however, is just what a magnificent drummer Gavin Griffiths is. It’s all too easy to overlook his contribution when he’s hidden behind his kit. But here, his poise, timing and technique are revealed for all to see. It’s something of a personal highlight, along with the wonderful fade at the end of ‘Chameleon’ – through Jon Edwards jangly keys, Dave Foster’s bluesy lead lines, and Anne-Marie’s exquisite flute, the sheer delicacies of ‘Firefl’y, the late night blues of ‘Denial’, and some searing versions of Panic Room ‘classics’, too many to mention (without running through pretty much the whole set list!). Having been an ardent follower of the band since their debut Visionary Position almost 10 years ago, I can say that Screens does an excellent job of capturing the experience of the band’s live performances, and ‘Roomies’ will, no doubt, be delighted. Panic Room play Robin 2, Bilston, West Midlands on Friday 10 November. This entry was posted in ALBUM REVIEWS, ALBUM REVIEWS (Mobile), All Posts, DVD REVIEWS and tagged album, Anne-Marie Helder, Dave Foster, DVD, Gavin Griffiths, Jon Edwards, Live in London, Panic Room, prog, progressive, review, rock, Screens, Yatim Halimi. Bookmark the permalink.